The award-winning Education Division of the Mortgage Bankers Association (MBA) recently recognized 17 individuals with its Certified Mortgage Banker (CMB) designation. The recognition ceremony was held at MBA's 102nd annual Convention & Expo in San Diego. Earning a CMB is the highest professional honor within the real-estate finance industry. Among the 17 individuals recognized was Thanh Pham, relationship manager for Associated Bank in Chicago. Candidates have the option of choosing among the Commercial CMB, Residential CMB or Master CMB designations. The Master CMB is a combination of both commercial-and residential-mortgage-banking disciplines, while the Residential CMB and Commercial CMB focus on their respective subfields of the mortgage industry. Of the three, Pham chose Residential CMB. In order to be eligible for a CMB, candidates must acquire 150 points through a combination of professional experience, secondary education, continuing education through MBA-sponsored events and MBA education courses, as well as participation in MBA at the local, state and/or national levels. After accumulating the required points and passing a comprehensive written exam, candidates must demonstrate industry knowledge by passing an oral exam conducted by a panel of certified mortgage bankers. Furthermore, candidates must either work for an MBA-member company or be a member of a recognized state MBA. Every candidate for an Executive CMB is required to have a minimum of 10 years of experience in real estate finance and hold a senior-management position at an MBA-member company. Although Pham’s preparation took several years and hard work, he encourages anyone with an interest in real estate finance to pursue the designation. "The knowledge that comes with the CMB accreditation is the most significant component of this honor because it positions one to navigate today's ever-changing landscape," said MBA Chairman Bill Emerson. "I applaud this year's graduates and wish them luck in their continued career advancement." 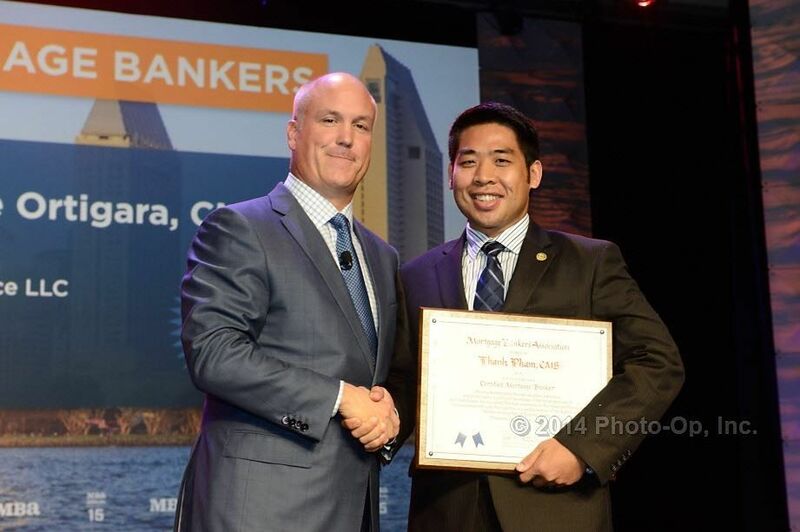 Photo caption: Bill Emerson with Thanh Pham after receiving his CMB award.